Dismayed, sad, and angry all at the same time. These was how Kalikasan-People’s Network for the Environment (Kalikasan-PNE) felt about the decision of the Commission on Appointments (CA) to reject the confirmation of the appointment of Department of Environment and Natural Resources (DENR) Secretary Gina Lopez. “Nagpapakita lang ito kung gaano kalakas ang hawak ng mining oligarchs sa gobyerno (This only shows how strong the mining oligarchs’ hand in the government),” said Clemente Bautista, Kalikasan-PNE’s National Coordinator in an interview with Manila Today. Bautista added that Lopez directly went against the interest of the comprador bourgeoisie. “Walang siyang sinino, walang takot (She did not fear crossing anyone),” he said. 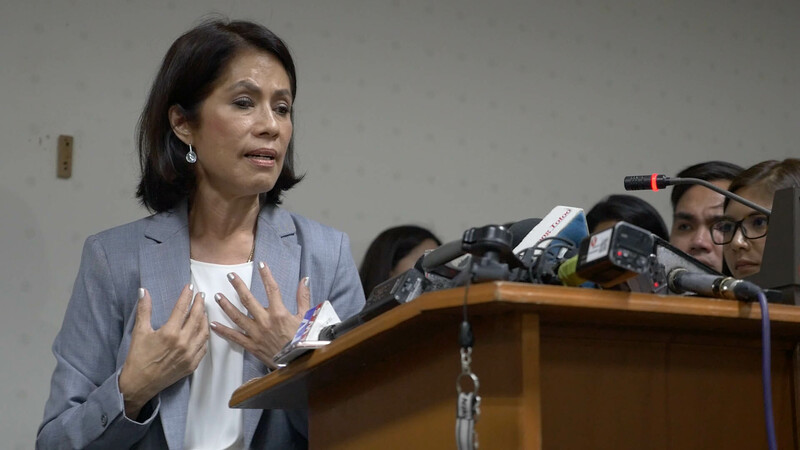 Bautista claimed that Lopez’s rejection is a concerted effort of mining conglomerates and media magnates involved in mining to turn the tide of public opinion against Lopez and the reforms she implemented in DENR. He referred to Manny Pangilinan who is the Chairman of Philex Mining and also the Chairman of TV5 and a major shareholder of Philippine Star. The Philippine Daily Inquirer, he pointed out, whose Chairman Alexandra Prieto-Romualdez is the wife of Benjamin Philip Romualdez, the President of the Chamber of Mines in the Philippines and Chairman of the oldest mining company in the Philippines, Benguet Corporation. On May 3, the CA voted against Lopez’s confirmation of after the final hearing the day before the vote. Reportedly, out of the 25 members of the bilateral CA, it was a 15-9 vote against Lopez’s confirmation. In February, DENR announced its order of closure of 23 mining companies and suspension of five after the Department’s mining audit. Meanwhile, in April, DENR released its Administrative Order No. 2017-10 banning open-pit mining of copper, gold, silver and other complex ores. “Ang mga bumoto laban sa confirmation ni Gina Lopez ay galing sa mga pamilya na may mining companies, at tingin namin ay naimpluwensyahan ang iba pang myembro ng CA (Those who voted against Gina Lopez’s confirmation come from families with mining companies, and we believe that the other CA members were influenced),” claimed Bautista. Bautista is referring to Rep. Ronaldo Zamora of San Juan whose elder brother Manuel Zamora, Jr. is the Chairman of the Board of Nickel Asia Corporation, one of the largest nickel mining corporations in the country. Rep. Wes Gatchalian of Valenzuela, son of William Gatchalian is the Chairman of Wellex Group and has a mining arm, the Wellex Mining Corporation. Wes is even listed as the Vice President for Investments & International Affairs in the Wellex Group’s website. President Rodrigo Duterte also commented on Lopez’s CA rejection in a speech during a gathering of doctors in Davao City on May 4. “Sayang si Gina [I regret that Gina was not confirmed]. I really like her passion…But you know how it is. This is democracy, and lobby money talks,” said Duterte. Kalikasan-PNE and other progressive organizations trooped to the Senate on May 3 to show support for the confirmation of Lopez and Social Welfare Secretary Judy Taguiwalo and Agrarian Reform Secretary Rafael Mariano. Bautista said they supported Lopez because of the positive reforms she implemented for the environment, that they describe as unprecedented. According to him, these include reforms in handling the mining industry, which showed that the government should end destructive mining operations which the people do not ultimately benefit; the ban of large fish pen in Laguna Lake which took up most of the fishing grounds for small fisherfolks in the lake; and, pushing for the continuation and success of the peace talks between the Government of the Republic of the Philippines (GRP) and the National Democratic Front of the Philippines (NDFP). “My choice for DENR secretary is President Duterte… I can’t think of any other person. It needs guts. It needs tapang because you have to step on business interest,” said Lopez during her press conference in the Senate on May 3 and her media interviews the following day. Kalikasan-PNE enumerated the qualities the next DENR Secretary should possess. “Ang katangian dapat ay may puso para sa maliliit at karaniwang tao katulad ng magsasaka, katutubo at mangingisda. Kailangan din ay matapang, hindi takot na sumalubong sa oligarkiya at militar (The next Environment Secretary should have a heart for the small and ordinary people like the farmers, indigenous people and fisherfolks. S/he should also be brave, not afraid to go against the oligarchy and military),” enumerated Bautista. He added that the next Secretary should also be smart, not only in the protection of the environment but also knows how to wisely manage the country’s natural resource for development purposes. “Dapat din ay open sa participation ng people’s organizations and movement para sa mga reporma sa gobyerno (S/he should also be open to the participation of people’s organizations and movement for reforms in the government),” said Bautista. Bautista said that whoever the next Secretary would be should be in the league of the likes of Gina Lopez, DAR’s Rafael Mariano and DSWD’s Judy Taguiwalo.